Christopher Dorner, the ex-Los Angeles police officer who declared himself on a killing spree against his former law enforcement colleagues, is dead. Authorities this evening confirmed that remains found after a fiery standoff at a California mountain cabin Tuesday were, in fact, Dorner's. "The charred human remains located in the burned out cabin in Seven Oaks have been positively identified to be that of Christopher Dorner," the San Bernardino County Sheriff-Coroner's Office said in a written statement. "During the autopsy, positive identification was made through dental examination." In a 6,000-word "manifesto," Dorner outlined his anger at the Los Angeles Police Department for firing him, and made threats against individuals he believed were responsible for ending his career with the police force five years ago. Dorner was fired after filing what the LAPD determined to be a false report accusing other cops of brutality. Dorner is suspected of killing four people, including Monica Quan and her fiance, who were found shot to death Feb. 3. Quan was the daughter of former LAPD Capt. Randal Quan, who was mentioned as a target of Dorner's fury in the manifesto. Dorner is also suspected in the shooting death of Riverside, Calif., Police Officer Michael Crain, whose funeral was Wednesday. San Bernardino Sheriff's Deputy Jeremiah MacKay, 35, a 15-year veteran and the father of two children, was killed in Tuesday's shootout at the cabin. A second San Bernardino County sheriff's officer had to undergo multiple surgeries after he was wounded in the cabin shootout, and other officers also were wounded in earlier alleged encounters with Dorner. After Crain's death, police tracked Dorner to the Big Bear Lake area of Southern California, where his burning truck was found in the mountains late last week. A couple with a cabin in the area were some of the last people to see Dorner before his final encounter with police. Their 911 call to police triggered a chase that concluded with the fiery standoff at the nearby cabin. The couple, Karen and Jim Reynolds, said at a news conference Wednesday that their ordeal lasted a few minutes but seemed like hours. The Reynolds believe Dorner, 33, was holed up starting Friday in their unoccupied cabin in Big Bear, Calif., only steps from where police had set up a command center. Dorner tied their arms and put pillowcases over their heads before fleeing in their purple Nissan, the couple said. 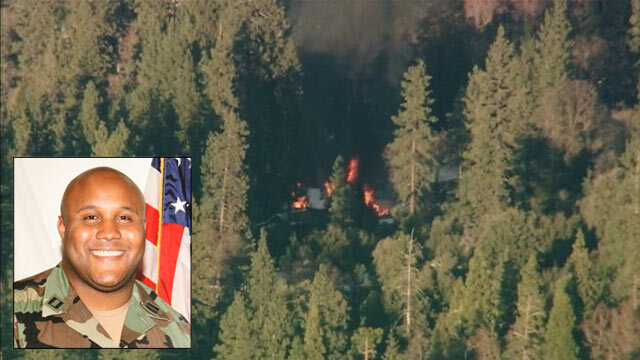 Before he fled, the couple said Dorner told them that he had been watching them before he took over their cabin. Dorner told the couple he could tell they were "hard working, good people." "He had been watching us and saw me shoveling the snow Friday," Jim Reynolds said. They say they may have left the cabin door unlocked and that could have been the reason Dorner was able to enter undetected. Dorner remained "calm and meticulous" throughout the harrowing ordeal, the couple said. The Reynolds walked into their cabin around noon Tuesday when they came face-to-face with Dorner. There was no question in their minds who he was -- the suspected cop killer at the center of one of the largest manhunts in recent memory. "I thought we were dead," Jim Reynolds said with a nervous chuckle. The whole ordeal lasted about 15 minutes, but felt much longer for the couple. "It felt like 15 hours with him," Karen Reynolds said. Dorner, Reynolds said, first asked them to remain calm. Reynolds screamed and attempted to escape before Dorner caught up with her. "I never even knew my reaction would be to run, but it was," she said. Dorner tied them up and told them they were a means to his end, and wanted their car to escape. "At first he kneeled down beside me and said, 'You're going to be quiet, right? Don't make a muss, don't try and get loose. Give me time,'" Jim Reynolds said. The Reynoldses finally managed to break free and untie themselves after Dorner escaped with their car. Earlier reports said that two female maids were taken hostage by Dorner. After Dorner fled the Reynolds' cabin, he moved to another cabin in the area where he apparently engaged in the shootout with police before the building was consumed by flames. "We did not intentionally burn down that cabin to get Mr. Dorner out," San Bernardino County Sheriff John McMahon told reporters Wednesday evening, although he noted that pyrotechnic canisters known as "burners" were fired into the cabin during a tear-gas assault in an effort to flush out Dorner. The canisters generate high temperatures, he added.